Download "Practice Exam. 3 A Division II institution may make a four-year athletics scholarship offer to a prospective student-athlete. A) True. B) False." Division II Recruiting/Scouting Service FAQ. What does the definition of recruiting/scouting services include? The Essentials What is a Countable Athletically Related Activity? What counts? What doesn t count? Transfer Rules. Q: If I transfer to another four-year institution, will I immediately be eligible? FINANCIAL AID AND NLI Grant-in-Aid An athletic grant-in-aid can consist of tuition and fees, room and board, and required courserelated books. A grant-in-aid may be offered as a full or partial award. MEMORANDUM. TO: NCAA Division I Football Student-Athletes with Remaining Eligibility. 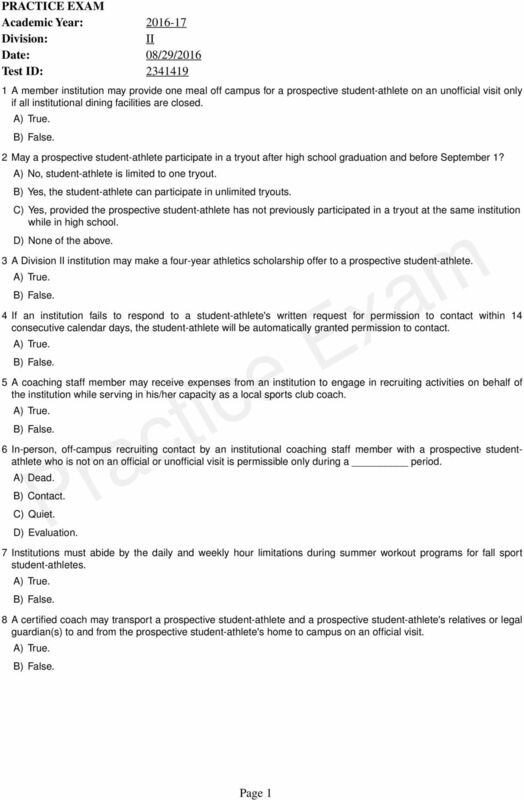 NCAA Rules and Regulations for Representatives of Athletics Interests ASK BEFORE YOU ACT! (Updated: December 17, 2015) NCAA Division I Proposal 2015-15 Autonomy Proposal -- NCAA Membership -- Conditions and Obligations of Membership -- Independent Medical Care How is "administrative structure"
NCAA RULES FOR MARKETING AND PROMOTIONS 2002-03 ** ALWAYS REFER TO THE NCAA MANUAL FOR SPECIFIC INFORMATION ** Promotional Activities 12.2.1.1 Institutional, Charitable, Educational or Nonprofit Promotions. Your Path to the Student-Athlete Experience NCAA Eligibility Center Expires September 1, 2016 Overview Steps to Achieving Your Eligibility. Initial-Eligibility Requirements. Sports Participation. Resources. INTRODUCTION AND SUMMARY OF IVY RULES FOR IVY COACHES AND ADMINISTRATORS I. Preface The Ivy League was formed by the Council of Ivy Group Presidents Agreement in 1954, and began formal competition in 1956-57. NCAA Clearing House. Understanding the rules of eligibility. AN ACT REQUIRING FULL DISCLOSURE TO PROSPECTIVE ATHLETES BEING RECRUITED TO INSTITUTIONS OF HIGHER EDUCATION.